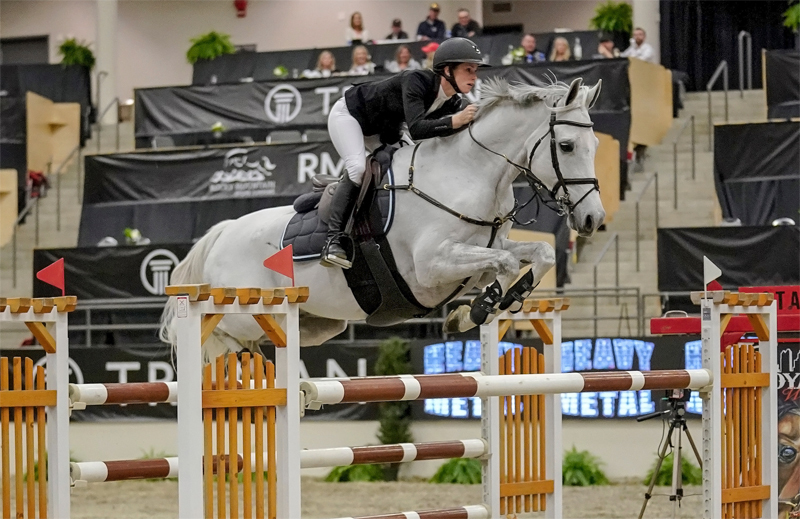 Jacqueline Colborne secured the win in the $35,500 Heavy Metal Equipment Cup CSI2*, concluding the second day of Royal West 2018. Colborne and Flemins Bouncer, a 10-year-old Irish breed gelding and new partner, locked in their position on the podium with a quick jump-off time of 43.39 seconds. Holly Scapa and Tarrabas Du Maraly went eleventh in the jump off, jumping a tidy round just off the pace with 43.85 seconds on the board. Finally, John C Anderson and Terrific reserved the third place position with 44.15 seconds. Tonight’s Cup began with a total of 42 entries and 15 continued to the jump-off. Werner Deeg designed the tough 15-effort course. “It was a great course tonight – both the first round and the jump off. I was a little slow in the beginning but then I heard my trainer [Kyle King] say, “get going” and then after that it all went smooth,” said Scapa. Kristjan Good aboard Diamo Blue claimed the win for the $10,000 Canadian Hunter Derby. Good and the Oldenburg stallion, Diamo Blue, went first in the 3’6” section. “The course rode exactly how I thought it would. The last jump came up fast but Diamo Blue handled it really well,” said Good. Brent Balisky and Class Act, the winners of the $10,000 Canadian Hunter Derby 2017, made tonight’s course look effortless with a score of 104 putting them in second place. Ella Cole and Cheers stole the show in the 3’3” section. Cole was the highest placing junior with a score of 99. Not far behind, a score of 98.5 was awarded to Kristjan Good and his second mount, Salvo RSF. Calgary native, Kyara Semaru rode Cori Coletta, a Hanoverian mare, in tonight’s class. “My plan was to have a smooth and consistent round, jump all the high options and do all the handy turns. Cori Coletta was previously a jumper, so I needed to be mindful to manage her pace and rhythm,” explained Semaru.